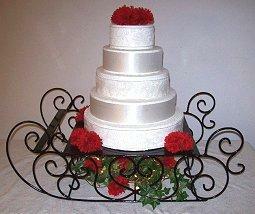 Iron stands for wedding cakes won't disappoint couples looking to showoff their wedding cake design. An iron stand trumps plain, dull wedding cake stands that detract from gorgeous cake designs. Distinctive cake stands made of iron are ideal choices for showcasing these nuptial confections. 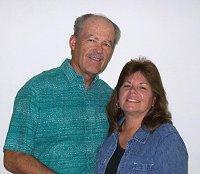 Husband and wife team Betty Jo and Michael McNulty have been designing iron artwork, including wedding cake stands, for several years. Michael has been doing metal work since high school, and now they collaborate to create unique and beautiful work in central California. 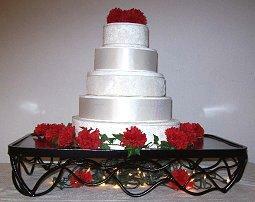 LoveToKnow (LTK): What tips would you give a couple who is deciding on a cake stand? Betty Jo and Michael McNulty (BJMN & MMN): As to what cake stand a couple might use, there some things that must be taken into consideration. If the wedding has a theme or ideas that it is based around, that will point us in a direction of what to use. 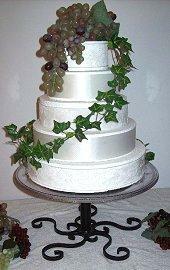 But when there is no real theme, we must always remember that second only to the bride and groom, is the wedding cake. Just as the tiara is a must for a bride to ware to be a Cinderella, so to our elegant cake stands can add the finishing touches and give memories that they will cherish. So to make that day really unique, it is good to let one's imagination run wild at times. LTK: After the wedding, how could a couple reuse a cake stand? Do you rent stands? BJMN & MMN: After their wedding those who have bought ones have said that they are going to use the stands for parties and holiday events. But in our area many just rent our stands. 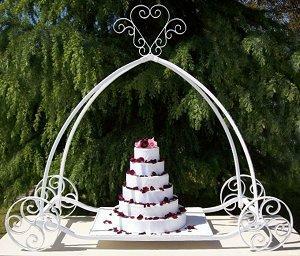 LTK: Why did you first start designing iron wedding cake stands? BJMN & MMN: What got us started was a baker asked us to build some cake stands for them. Wondering what they needed and what they had been using, we started looking around, asking questions, and hearing about cakes falling, so we saw a need. LTK: What different stand designs do you offer? BJMN & MMN: We have made Cinderella carriages, a Western carriage with wheels that look like wagon wheels and a roped in heart, Snow Sleighs, vine and branch styles, and round ones of different heights. LTK: How do you create a cake stand? BJMN & MMN: We start with a drawing based on the size of the cake and the overall size of the stand. Next we look at what type of material we will use and if it need to come apart for shipping or be strong for renting. Like the Cinderella carriage cake stand, it comes completely apart. Wheels, hoops and toppers all come off the base for storage and transport. LTK: What size cakes can your stands accommodate? BJMN & MMN: We make them to fit the need. We have made round ones to fit 6" cakes on up to an 18" round we are working on now. Our carriages have an area 21" deep and 26" wide. 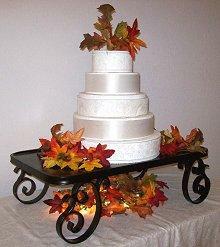 LTK: How long does it take you to create a wedding cake stand? BJMN & MMN: It will take about 2 weeks to make and paint most items. But the more detail it has, the longer it can take. Also our work load of standing orders can be over 6 weeks. LTK: What gave you the inspiration for your Cinderella carriage cake stand? BJMN & MMN: We talked to some bakers, some planners, and then checked the internet, there again found a need that we could fill. Because of reports we heard, we wanted to make sure that ours would last, that it would not easily break, so we chose to stay with lightweight metal. The one thing that can ruin a great event is to have the cake fall -- no bride or baker wants that. LTK: How much does a stand cost? BJMN & MMN: Cost is always based on design, art, and size. Most run $100 to $400, but we have made some for over $1800. LTK: Do you provide shipping services for distant brides? BJMN & MMN: Yes, we have shipping. We have shipped stands to Florida, Mexico, and California, and have been asked about one going to France. LTK: What new cake stand styles are you planning? BJMN & MMN: We are working on a few other styles of stands. A lighter weight Cinderella carriage, a stand that will go with grapes and wine, and yet another that will have roses on it. LTK: What additional wedding decorations can you create? BJMN & MMN: Right now we have candle holders to go with our carriages that sit on the tables. We are working on tall tabletop flower stands that look like a tree with roots, also vine arches, and one that is still on the drawing board is a Cinderella carriage arch that will fit over normal doorways so guests, the bride, and the groom can walk in through it for a grand entrance and for pictures. Our thinking is that guests having their pictures taken as they come through allows them to be a part of the event, instead of just being a spectator.